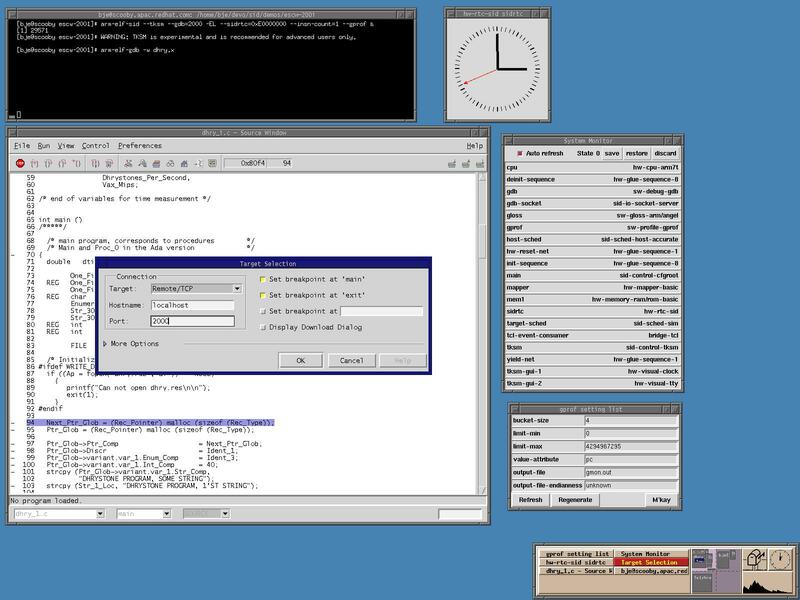 The following screenshots are part of a demonstration given at the Embedded Systems Conference in 2001. They are snapshots of a more in-depth demonstration of SID's capabilities for debugging and profiling embedded software. Note that these images are quite large (approximately 200KB each). This screen shot shows make processing a simple Makefile to build two ARM programs that will be the basis for study: the canonical "Hello world" (hello.x) and the Dhrystone benchmark (dhry.x). This screen shot shows the easiest way to invoke SID for well-known target configurations. In the case of the ARM7T, arm-elf-sid can be used to run a program stand-alone. The arm-elf-sid program accepts a --no-run option, which writes out the SID configuration file needed to run the simulation and then stops. The configuration file is shown in the window to the right. 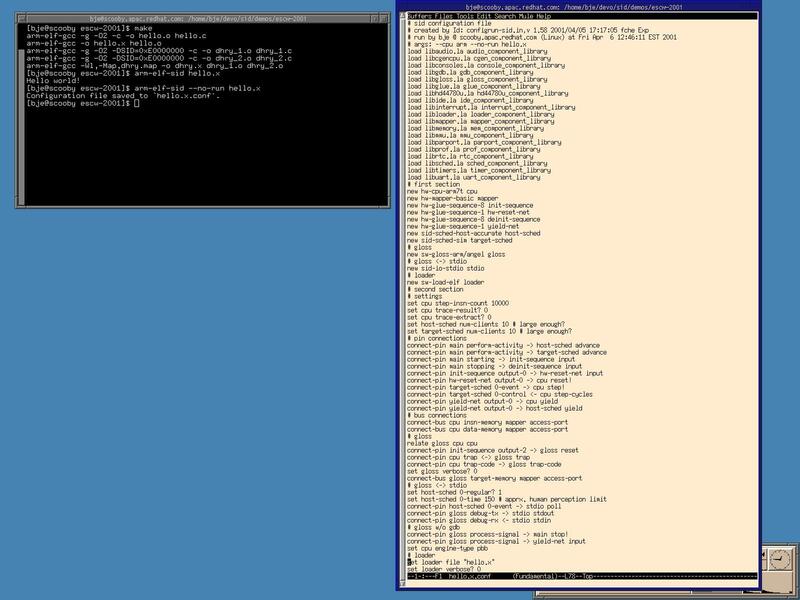 This screen shot shows arm-elf-sid running the Dhrystone benchmark. Prior to running the benchmark, some different options are given and the differences in the generated SID configuration file are shown. This screen shot shows arm-elf-sid run with profiling enabled. The gprof component samples the program counter at periodic intervals and writes an output file suitable for processing by the gprof program. The results of the profile are shown inside GNU Emacs. the Tk system manager listing instances of components in the system. an xclock clone depicting the time inside the simulator's real-time clock. a window showing the user-adjustable settings exported by the gprof component. GDB about to connect to the simulator's gdb stub component and step through the program.